Each Tuesday in October, Katie is taking over my blog to talk about her experience with breast cancer. You can read week one here. When I first heard that I had breast cancer, there were 3 things that flashed through my mind. 1 - Was I going to survive this. 2 - I was going to lose my hair, my eyelashes, and my eyebrows. and 3 - Was I going to be able to have kids, and when would I be able to. Today's post is going to be about my third worry. When I told my oncologist that I didn't have kids yet and that I did want them, she said the first thing I'd have to do, before any treatment began, is reserve eggs or embryos. Because I was receiving neoadjuvant chemotherapy - chemotherapy before therapy, as a lot of younger women do - I had to go through fertility preservation treatment first, or else the chemotherapy could attack my egg cells and might put me into early-onset menopause. And we had to start NOW, so that my chemotherapy could be started immediately after. Because she wanted it done so quickly, she sent me to Cleveland, as Pittsburgh was known to take longer. I was really relieved that my oncologist brought up fertility, and gave me hope that having kids would be possible in my future, but I was also devastated at the same time. I knew that we weren't ready for kids yet, but it was something that we were starting to talk about, and it kind of felt like the rug got pulled out from under us. Everything started to happen really fast. 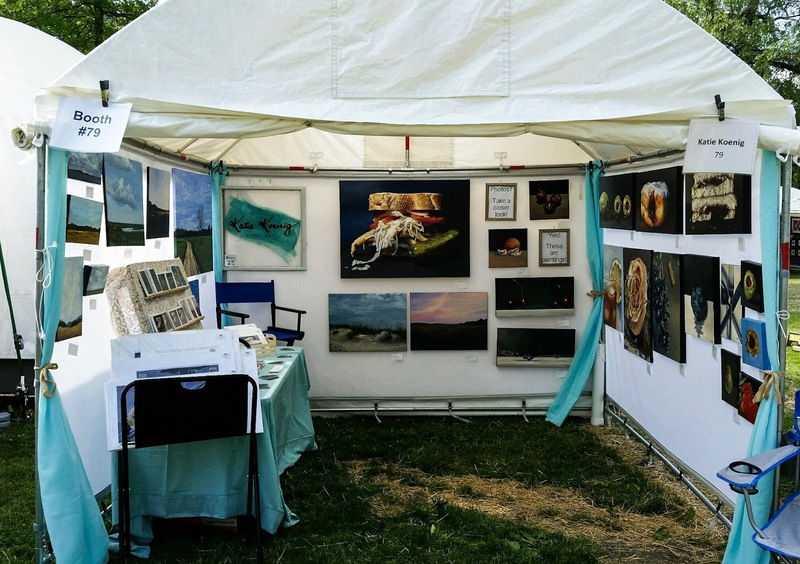 As it turned out, I had an art festival in the Cleveland area, and the doctor there was able to work with with my schedule and fit me in while I was there. It was a whirlwind - I had to decide right then and there if I wanted to freeze my eggs or embryos. Because embryos are usually more successfully frozen, my husband Terry and I chose to do that. Choosing embryos meant that Terry and I both had to send our bloodwork out to a lab for birth defect genetic testing - happily, I can report that the only thing I was a carrier for was a biotin deficiency! We also had to decide, legally, what would happen to the embryos if we got divorced, or if either of us died - it was surreal to make this decision in such a business-like way. Terry had to donate his sperm, so that the eggs I would be harvesting could be fertilized, and we talked through the egg harvesting process. Every day, I had to inject multiple drugs into my body to boost egg production so that they could be sure to harvest just the right amount. The nurse demonstrated how to do the injections, had me practice, gave me the drugs that they had on hand, and gave me a prescription to take to the pharmacy for the rest. I had to have an ultrasound and bloodwork done every other day (back home in Pittsburgh) to look at the follicles of my ovaries and check my progress. I took a little bit longer than they expected, so I had to be sent additional medications - the Livestrong Foundation sent them to my house, on dry ice, and it looked like I lived in a mad scientist's lab! After about two weeks, my eggs were ready to be harvested. I had to give myself one last trigger shot - triggering the release of the eggs - and had to take a pregnancy test to make sure that the triggering worked. The next day, I was back up in Cleveland to do the actual harvesting. It's a surgical procedure - they put me under, and the doctor aspirated my ovaries and got all of the eggs out, and then I went home! Initially, they told me that I had 12 eggs and eight embryos. Seven of those divided successfully and were healthy enough to be frozen. Those embryos are still in storage right now in Ohio. It may turn out that I don't need them, and I am able to conceive naturally, but they're waiting for us if that isn't the case. My oncologist told me right off the bat that I'd have to wait at least a year (preferably two, but I pushed her on it!) after finishing treatment to start trying to have kids. The recurrence risk is highest in the first two years, and if I were to try to conceive naturally, I'd need to wait because no one knows the effect that chemotherapy has on egg cells. I mentioned the Livestrong Foundation earlier. They were involved because these kinds of fertility treatments can be astronomically expensive. The Foundations helps cover the costs for young women with cancer, so that they have to pay much less for these treatments. I feel very fortunate that this Foundation was there to help make things easier for me in such a stressful time. Once the fertility treatment was finished, chemotherapy could begin, which I'll talk about in next week's post.